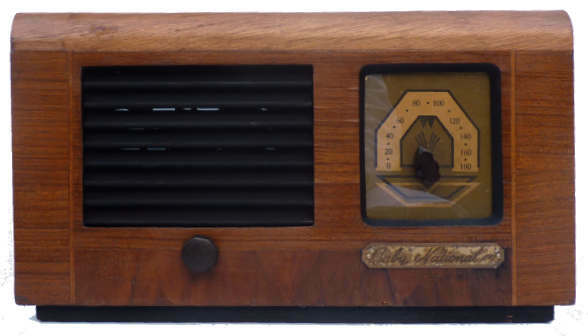 Baby National 4 valve TRF table top radio in veneered plywood case. The valve lineup is as follows: 6K7 6K7 25A6 and KT33C. It is an AC/DC set with a live chassis. The KT33C is an output pentode used here as a half wave rectifier. 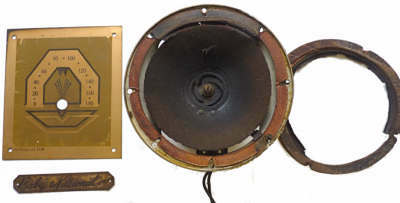 As can be seen from the pictures the radio was in a poor condition, externally the veneer had lifted in several places due to the combination of internal heat and storage at some point in a damp environment. To gain access to the chassis I had to smash the volume control knob which was seized solid on the shaft. 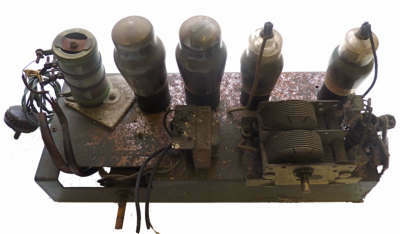 The set was wired to a two pin plug (one pin marked with red paint) and a quick check revealed that one of the connections on the dropper resistor was open circuit. 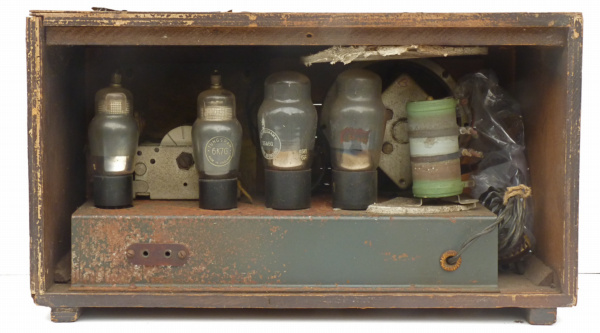 I also noted that the main electrolytic smoothing capacitor which tested OK was not original (it was dated 1955) and discovered that both the low voltage electrolytic capacitors were open circuit. I replaced the latter and the 0.02 mFd capacitor on the incoming supply. 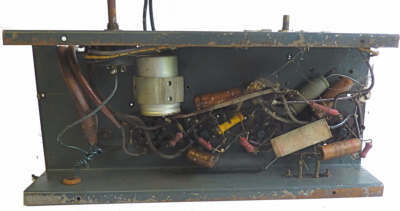 The old twisted wire mains lead was discarded and the dropper resistor was bolted to the chassis after the asbestos insulating mat had been removed. A temporary loudspeaker was connected to the output transformer and the set energised via my variable voltage supply. Nothing spectacular happened even with 240 Volts applied. 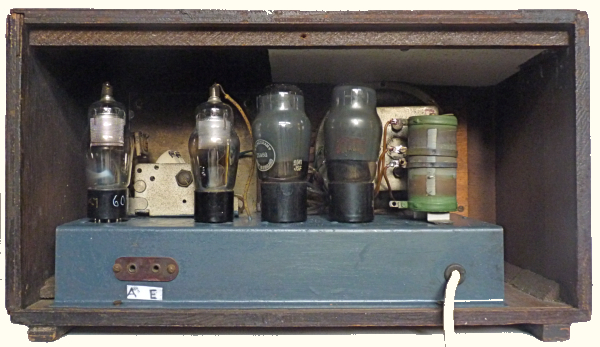 There was some noise from the speaker and crackles when the valves were jostled or the tuning capacitor was rotated but no signal to be heard. Although the set was drawing just over 300mA the voltage across the heater string was only 50 Volts. A closer examination of the dropper revealed that at some stage it had burnt out and the opposite (good) end utilised by swapping the connections. I calculated that a resistance of 560 Ohms would be needed to provide the 72 volts required for the heater chain and something in the region of 220 Ohms would do for the HT. When this was done the vanes on the tuning capacitor were checked and the valve pins on the 6K7s and their bases were cleaned. A faint signal could now be tuned in when a long aerial was connected but when I substituted another 6K7 for the first one the set burst into life, Radio 5 Live loud and clear. With the set more or less functioning I turned to the cabinet and speaker. 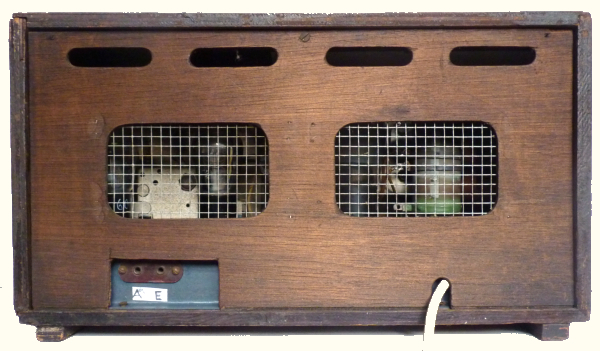 The asbestos mat fixed above the dropper resistor was removed as was the veneer from the top and curved area of the case. The varnish was removed using paint stripper and wire wool and after a light sanding and staining the whole case was treated with Danish Oil. I cut and fixed a piece of fire proof board inside the top of the cabinet above the mains dropper. A transparent cover from a CD case was cut and drilled to replace the distorted and discoloured window for the tuning dial. The loudspeaker coil was OK but the spider at the center was cracked in two places so a few drops of adhesive were applied and left to set before proceeding to fix the cone. I cut a circle of cloth of the right diameter and cut out the centre to make an O ring and glued this to the frame using PVA woodworking glue. 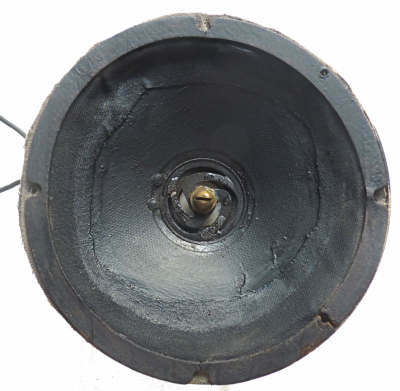 When this had dried the inner part of the cloth ring was glued to the outer edge of the speaker cone. Finally a thin coat of black paint was applied the cone and the repair. Chassis painted, note that the Aerial and Earth sockets were incorrectly wired. You can also just see where the mains dropper had originally failed. Wire mesh stapled to the inside of the back cover. This is one of a number of radios which belonged to the late Ron Griffiths which were given to me by his widow in 2013. Ron was was an engineer, working for himself and making parts for other firms. He made some items for the Pastorelli firm - brass cases for surveying equipment that is used in tropical climates - and also brass parts for Cambridge Instruments. 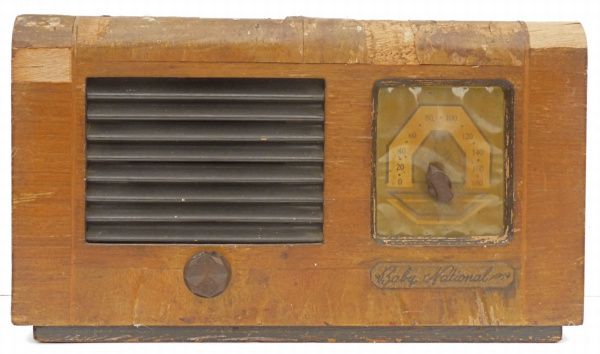 I have not been able to find out anything about the maker of this little radio, but it is clear that it was manufactured in the UK and from the markings on the wax capacitors I guess it dates from 1938. The nameplate on the cabinet hides two holes which indicates that the firm possibly made another set with three in line knobs on the front.